You know the feeling. You are waiting in a cafe for a meeting and its 10 minutes past the agreed time…am I in the right place, is it the right day? Well, that was me on Monday morning. About 15 minutes late, Carolyn Tate arrived. She explained that as she was leaving for the meeting a courier arrived. 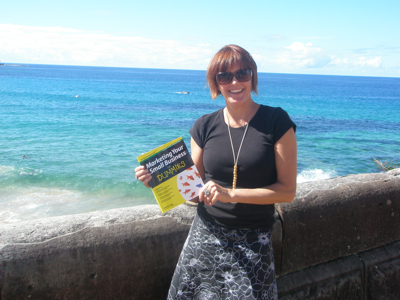 The delivery was the advance copies of her latest book, Marketing Your Small Business for Dummies. As far as excuses go it was a good one. I now possess the very first copy of the book which is available in stores in June. I was amazed to learn that she had written the book inside four months. Carolyn runs a company, Connect Marketing, focussed on helping small businesses be brilliant at marketing. We met in 2008 when we were both guests on the Sky News Money Makers program hosted by David Koch. We were speaking on various aspect of collaboration. And in case you are wondering, we met at Coogee beach.